1: Can you replace broken windows? Yes, we can install windows to match to your home. We supply all different shapes and sizes. Over the years at Stormshield we have pretty much supplied every type and style of window for all different purposes. We can assure that we can fit the window that you need to be installed in your home. 2: My windows do not match, can you replace my window with one that matches with the one I want? Of course we can, our professional team can work out what your existing window is and replace the one that doesn’t match. The replacement will be perfectly to scale and exactly match the other window. 3: What different types of windows do you supply? All sorts! We supply double glazing and even triple glazing windows for your home. We can provide windows for patio doors, vertical sliding sash windows, more traditional casement windows and much more! Feel free to contact us to find out if we can fit the type of window that you need for your home. 4: How Secure are your windows? All of our windows come with high security and safety features. The glass that we use is of premium quality and will keep your house secure. We assure at Stormshield that the products we supply will keep your home secure. 5: Do you install windows as well as supply windows? Yes we can install windows to match to your home. We supply all different shapes and sizes. Over the years at Stormshield we have pretty much supplied every type and style of window for all different purposes. We can assure that we can fit the window that you need to be installed in your home. 1: What conservatory designs do you offer? We offer an endless variety of conservatory designs, designed by us or bespokely designed. Our conservatory designs are also available to view at our showroom. If you require any inspiration for your conservatory design then feel free to come into our showroom to view and get an idea of what we offer. Our staff members will be happy to help you and can give you expert advice based on your needs. 2: I already own a conservatory; can I have a new roof over it? Of course you could, we can fit our Guardian Roofs over any design of conservatory including Victorian, Edwardian, P-Shape, Gable Ended and Lean To. We also can fit Guardian Roofs on any bespoke conservatory. 3: Do you also do orangeries? As well as conservatories, we also offer the most astonishingly designed orangeries for your home. Our orangery designs can be bespokely made to work with the current design of your home and look nothing less than magnificent. Orangeries are a fantastic alternative to conservatories. 4: Is there anywhere that I can view the conservatories first? Our conservatory designs are available to view at our showroom. At our showroom, you can also discuss your needs to our staff members and get support to find the conservatory design that is right for you. If you can’t make it to our showroom, do not worry as our conservatory designs are available in our brochures, you can view our brochures by clicking here. 5: What guarantees do homeowners get with conservatories/guardian roofs? Guardian have guarantees on the materials they supply to their network of 23 fabricators (the manufacturers). The UK fabricators actually build each tailor-made roof in their workshop before supplying it to the local installers (Team Guardian members). The external products such as insulation, timber etc will typically have their own individual guarantees. All Team Guardian members should offer a comprehensive written guarantee on their workmanship including the installation. 1: Do I have to make my own measurements before a kitchen is installed? Of course not, our team will come to you to make accurate measurements before your kitchen is installed. You can rely on us to make sure that everything goes as it should do. Measurements can be scheduled with us for free for whenever is convenient for you. 2: Do you have kitchen designs in your showroom? Yes we have examples of our fabulous kitchen designs in our showroom. Feel free to pop in to find a design that is right for you. Our team inside can show you around and will listen to what your needs are and give you expert advice. Our kitchen designs are also available to view in our brochures. Click here to see our brochures. 3: Can I get advice for my kitchen design? Yes, at Stormshield we start with you and find out what you really would like in your kitchen. We offer a free home visit in order to make measurements. During this visit we will discuss your expectations and what you would like in your kitchen. The measurements will allow the initial CAD drawings to be made to show what the kitchen would look like. 4: Do you offer installation? After the design of your kitchen is created and agreed on, we can fit your kitchen for you. Our professional team will install your kitchen when it is convenient for you and will complete the job as fast and as efficiently as they can. 5: Are your kitchens bespoke? Yes, our kitchens are designed to fit the design of your house. If you have an idea for your kitchen, our team will come to your home to make measurements in order for CAD drawings to be made so your design can come can be constructed. 1: I only want a new appliance, the rest of my bathroom is fine, can I have just the appliance I need to be fitted? Of course we can, if you just need a single appliance then contact us and we can give you the same service as we would to installing a complete new bathroom. Our team our easily contactable and are more than happy to advise you on your needs. 2: Do you have bathroom designs in your showroom? Yes we have a wide variety of bathrooms in our showroom that can be installed in your home. If you like the look of one of our bathrooms, speak to a staff member who can arrange measurements to be made in your home. 3: Do you offer installation? Yes, just like our kitchens, we offer an installation service once the final design has been created and agreed on. 4: Are your bathrooms bespoke? Our bathrooms are designed to fit the design of your house. If you have an idea for your bathroom, our team will come to your home to make measurements in order for CAD drawings to be made so your design can come can be constructed. 1: Can you design me a bedroom with my ideas? Yes, we can bespokely design you a bedroom from your preferences. Once we’ve talked through the options with you, we’ll survey the room and take all the important measurements before we begin the drawings, which can be changed and amended until you are 100% happy. 2: Can you fit wardrobes? Yes, the wardrobes in our bedrooms are designed and fitted to the room. Like the actual bedroom, they are bespokely designed and fitted perfectly to match your preferences. 3: Do you provide bedroom furniture? We provide bedroom furniture that will match the design of your bedroom with the design that we fit. You will find examples of the bedroom furniture that we provide in our Showroom. 1: Where is your showroom? Our showroom is located in Cramlington, it is not too far off the A1068 and from Cramlington train station. 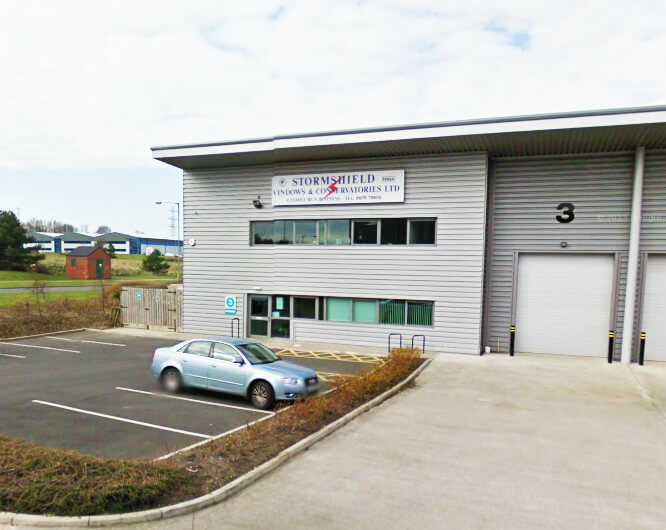 Full Address: Unit 3, Arcot Court, North Nelson Industrial Estate, Cramlington NE23 1BB. 2: How can we contact you? If you wish to contact us at Stormshield, then all that you need is on our contact us form. For our contact us page, click here. 3: What areas do you cover? We cover the vast majority of the northeast, the areas we cover include Cramlington, Newcastle, Tyneside, Morpeth, Ashington, Blyth, Alnwick, Hexham, Tynemouth, Killingworth, Whitley Bay, North Shields, Wallsend, Gosforth, Jesmond, Heaton, Ponteland, Darras Hall, Northumberland. 4: Can you tell me more about Stormshield? Stormshield is a family run, no salesman business. For 21 years, we have been supplying and installing a comprehensive selection of conservatories, windows, doors, kitchens, bathrooms and bedrooms in the northeast. We pride ourselves on the highly professional and friendly service we deliver with all of the products that we offer. Our expert advice is always available should you require it.